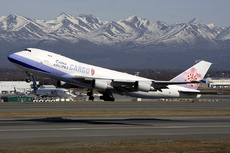 China Airlines Cargo flight CI5148 performed a go-around after touching down in the grass during an attempted landing on runway 10L at Chicago-O'Hare International Airport, Illinois, USA. The runway was subsequently closed for about 50 minutes and an inspection vehicle reported finding debris on the runway. Flight 5148 circled and landed safely on runway 09R at 15:20 UTC. Subsequent Notams stated that the Wind Direction Indicator (WDI) for runway 10L was out of service and an irregular surface was noted on the north side of runway 10L between taxiways DD and N1. The windsock is also located on the grass between DD and N1, north of 10L at a distance of about 1160 meters from the runway threshold and 42 meters to the left of the runway edge.